Erdheim-Chester disease (ECD) is a rare, multisystemic, idiopathic disease often associated with BRAF V600E mutation. Its diagnosis is typically delayed and challenging due to its variable manifestations. Although it has an indolent course, advanced stages can manifest fulminant behavior with multiple vital organ involvement. 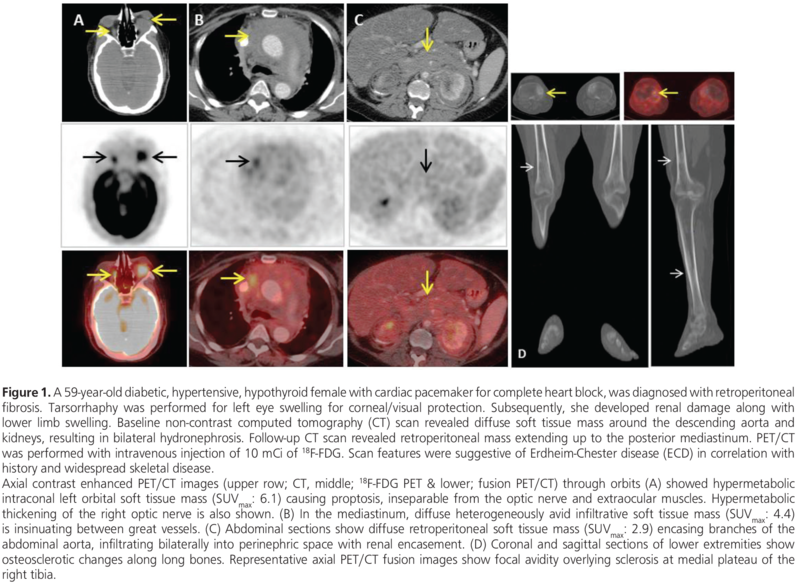 It is a class 2a, non-Langerhans cell histiocytosis with characteristic radiological appearance. Whole body imaging might be helpful, particularly, to assess skeletal lesions. Although widespread disease with typical skeletal involvement on imaging can prompt diagnosis, histopathology with immunohistochemistry is required for confirmation. The disease can also manifest itself with a large variety of central nervous system related or orbital symptoms. Cardiac involvement is quite common. 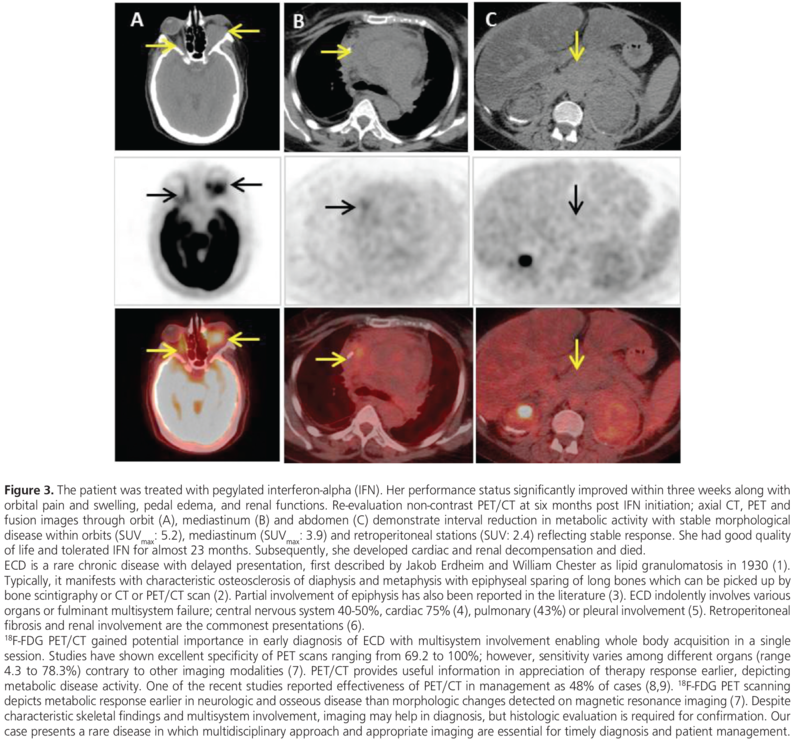 We present an interesting image of a patient with ECD who underwent PET/CT. Informed consent of the subject described in this image is waived by the Institutional Review Board. Surgical and Medical Practices: M.R., M.Q., A.Has., M.H., A.H., Concept: M.R., M.Q., A.Has., M.H., A.H., Design: M.R., M.Q., A.H., M.H., A.H., Data Collection or Processing: M.R., M.Q., A.Has., M.H., A.H., Analysis or Interpretation: M.R., M.Q., A.Has., M.H., A.H., Literature Search: M.R., M.Q., A.Has., M.H., A.H., Writing: M.R., M.Q., A.Has., M.H., A.H.
Chester W. Über Lipoidgranulomatose. Virchows Archiv für pathologische Anatomie und Physiologie und für klinische Medizin 1930;279:561-602. Diamond EL, Dagna L, Hyman DM, Cavalli G, Janku F, Estrada-Veras J, Ferrarini M, Abdel-Wahab O, Heaney ML, Scheel PJ, Feeley NK, Ferrero E, McClain KL, Vaglio A, Colby T, Arnaud L, Haroche J. Consensus guidelines for the diagnosis and clinical management of Erdheim-Chester disease. Blood 2014;124:483-492. Haroche J, Arnaud L, Cohen-Aubart F, HervierB, Charlotte F, Emile JF, Amoura Z. Erdheim-Chester disease. Curr Rheumatol Rep 2014;16:412. Haroche J, Charlotte F, Arnaud L, von Deimling A, Hélias-Rodzewicz Z, Hervier B, Cohen-Aubart F, Launay D, Lesot A, Mokhtari K, Canioni D, Galmiche L, Rose C, Schmalzing M, Croockewit S, Kambouchner M, Copin MC, Fraitag S, Sahm F, Brousse N, Amoura Z, Donadieu J, Emile JF. High prevalence of BRAF V600E mutations in Erdheim–Chester disease but not in other non-Langerhans cell histiocytoses. Blood 2012;120:2700-2703. Kenn W, Eck M, Allolio B, Jakob F, Illg A, Marx A, Mueller-Hermelink HK, Hahn D. Erdheim-Chester disease: evidence for a disease entity different from Langerhans cell histiocytosis? Three cases with detailed radiological and immunohistochemical analysis. Hum Pathol 2000;31:734-739. Cavalli G, Guglielmi B, Berti A, Campochiaro C, Sabbadini MG, Dagna L. The multifaceted clinical presentations and manifestations of Erdheim-Chester disease: comprehensive review of the literature and of 10 new cases. Ann Rheum Dis 2013;72:1691-1695. Arnaud L, Hervier B, Neel A, Hamidou MA, Kahn JE, Wechsler B, Perez-Pastor G, Blomberg B, Fuzibet JG, Dubourguet F. Marinho A, Magnette C, Noel V, Pavic M, Casper J, Beucher AB, Costedoat-Chalumeau N, Aaron L, Salvatierra J, Graux C, Cacoub P, Delcey V, Dechant C, Bindi P, Herbaut C, Graziani G, Amoura Z, Haroche J. CNS involvement and treatment with interferon-alpha are independent prognostic factors in Erdheim-Chester disease: a multicenter survival analysis of 53 patients. Blood 2011;117:2778-2782. Pan A, Doyle T, Schlup M, Lubcke R, Schultz M. Unusual manifestation of Erdheim-Chester disease. BMC Gastroenterol 2011;11:77. Haroche J, Cohen-Aubart F, Emile JF, Arnaud L, Maksud P, Charlotte F, Cluzel P, Drier A, Hervier B, Benameur N, Besnard S, Donadieu J, Amoura Z. Dramatic efficacy of vemurafenib in both multisystemic and refractory Erdheim-Chester disease and Langerhans cell histiocytosis harboring the BRAF V600E mutation. Blood 2013;121:1495-1500.